Bluetongue (BTV) is an insect borne viral disease of ruminants, especially sheep. BTV is a notifiable disease because of the considerable economic losses it causes. The spread of BTV has extended northwards. Serotype BTV-8 has been diagnosed in many Northern European countries including the UK. 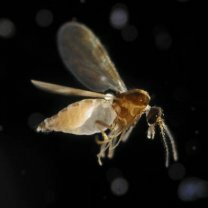 Recent outbreaks in Northern Europe have been attributed to climate change creating favourable conditions for the BTV virus vector, Culicoides midges. The range of the midges has extended northwards and environmental conditions allow for extended breeding seasons. Click on image above to open a full sized image. Click on image to go to the latest distribution map on the EUROPA website - bluetongue section. Once BTV is established in a country, it can be difficult to control and may be impossible to eradicate. The wide host range and the possible existence of latently infected carrier animals make elimination of the source of infection difficult. Vector control and vaccination is necessary for successful BTV control. Read more about Bovilis® BTV-8 on the MSD Animal Health Bluetongue website. For more information about Bluetongue and the control of BTV-8 in Europe see the MSD Animal Health Bluetongue website. A combination of vaccination, vector control and biosecurity is necessary for successful BTV control.